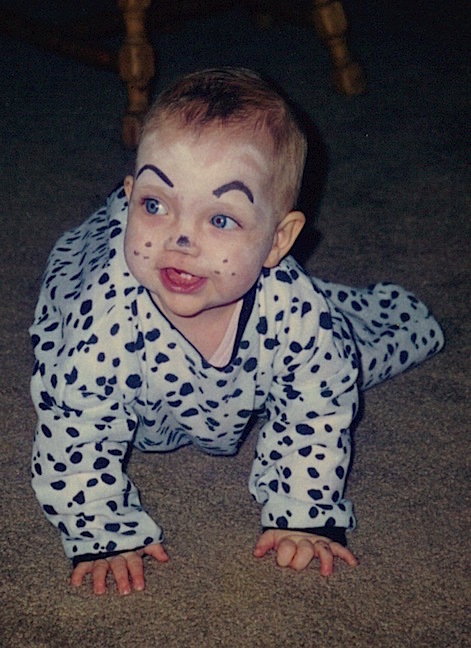 I dare you, I mean, I challenge you to find a more adorable Halloween costume photo than this one of Ella from 1997. She was 10 months old and both she and Chloe spent part of each weekday at a place called The Learning Garden. The night before Halloween, there was a Halloween costume contest at The Learning Garden, one that included adults and families. As you can tell from this photo, Ella was a dalmatian puppy. Chloe was Cruella de Vil, complete with blue eye shadow. And Melinda and I dressed as Cruella’s henchmen. It probably goes without saying that we won the contest.